Inside All About Books and Comics was a busy place. 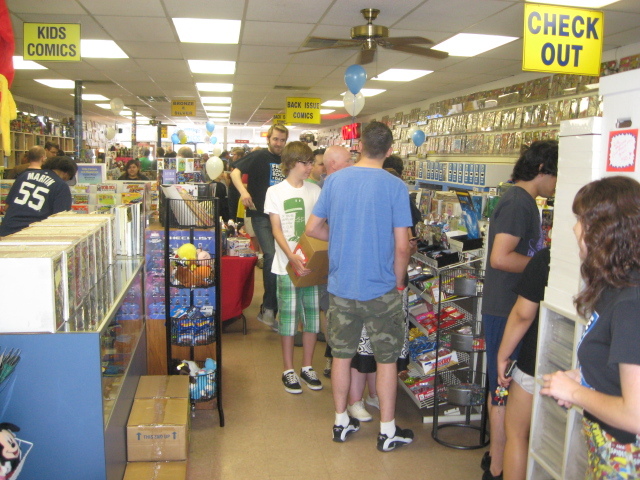 Free Comic Book Day is the first Saturday in May. It has become a major Geek/Nerd holiday in America. We put on our super suits, or our make-up if that’s the way you play, and get out to our favorite comic store, and get something for free, or we entertain, say hi to our friends, party, or . . . The idea is to share the joy of comics with the mundane world, but that’s just a rationalization. True mundanes are never going to be comic fans or anime fans or any kind of pop culture fans at all. True mundanes are hung up on politics, sports, business and money–the ordinary American dream. The good news is that there are more of us geeks and nerds all the time, and less of those true mundanes I’m talking about. 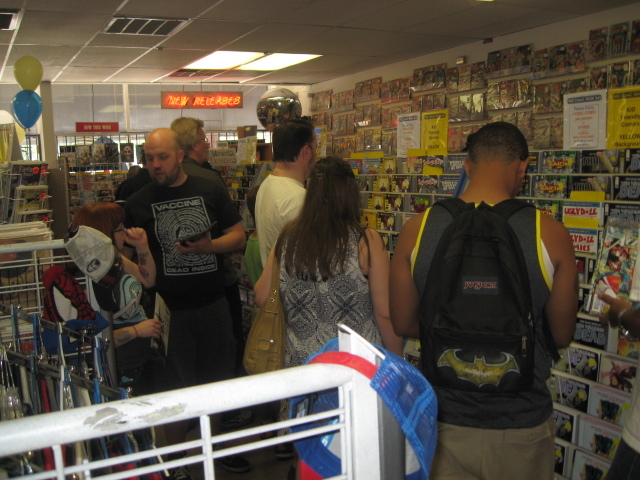 So, it won’t be much of a surprise to you that what I saw on FCBD was crowds, Crowds, and more CROWDS. Well, actually, there were less crowds at the third place I went to, and that was good, because I was actually able to get a couple of free comic books there without standing in a helluva line. And I hate standing in lines. 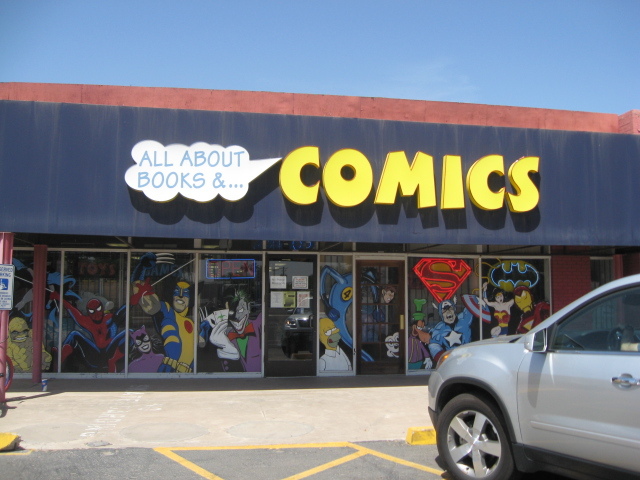 Alan Giroux, co-owner and founder of All About Books and Comics, started the first pure comic book shop in Phoenix back in the 70s, I was there at the beginning, though I didn’t take any pictures back then. I’m proud to say Alan is a friend of mine. I told Alan I wanted a shirt like his, but he just laughed it off. Well, that will be a minor quest for me. To get that shirt . . .
Dimly visible beyond all the shoulders is the rack where AABC put out the free comics this year. I couldn’t spend any time up close to it this year–the crowd was too thick. One thing you will see in these pictures. Comics aren’t for kids any more–not really. All of us kids grew up, kept our love for comics, but wanted more adult stories, and that’s what the comics world has become. Picture books for grown-ups, who haven’t really grown all the way up and out of such things. And why should we? Smile, Eddie! There is a cash register at both ends of the store. This one is run by Eddie Armendariz, who as assistant manager has the job I always wanted, but never got. 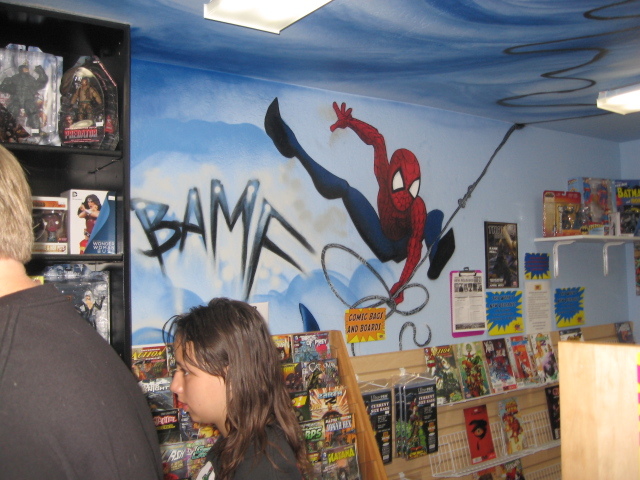 That wall of stuff in the background is all graphic novels and comics-related STUFF. There is so much comics-related STUFF to be had these days, and it’s all damn cool. So much good stuff, so little money, and worse, no place to put it all in a house that has a lifetime accumulation of great STUFF. This is the front of the store. It should have been the first picture I put up, but I do everything bass-ackwards, it seems, so I came in the back and went out the front, and went around the store to get back to my car and on to my next stop. After half an hour at All About I left and went a mile east to Alan’s main competition in town. 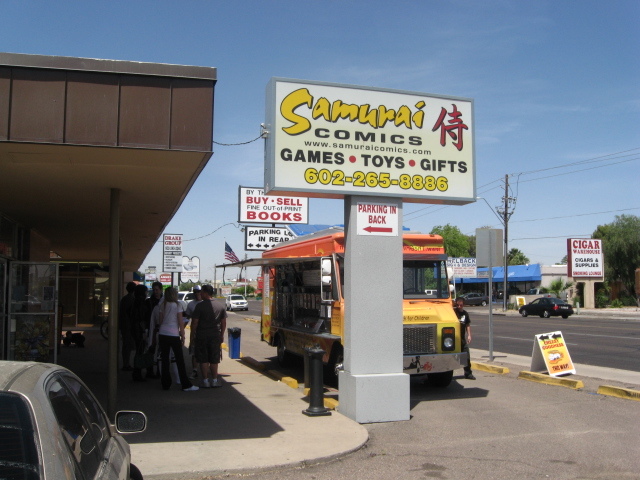 Samurai Comics is run by Mike and Moriya Banks. Is this a great sign, or what? If you look carefully, you might see some super-types lurking on the sidewalkl. It’s a truck full of food–there was one at All About also. It’s an all day party, and people get hungry. Great idea, actually. Samurai has more room on the inside than All About. Not more comics–just more open space. 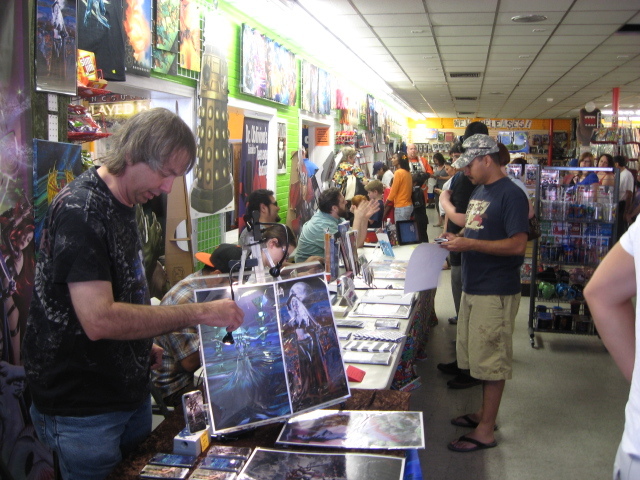 That makes it a good place for gaming, with collectible cards being a large part of the business, and also a great place for artists to come and show their work. For people just getting into the comics scene this is a great place to come and meet creators–some who have already made names for themselves, and others who are still on the rise. 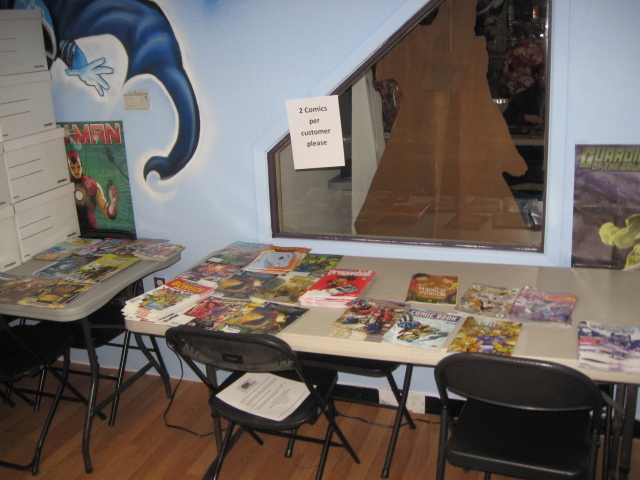 The free comics here were piled on tables inside a side room usually reserved for gaming. The line to get at them was so long and so thick that I had a hard time getting this picture. Not being willing to stand in line for an hour, I didn’t even get to see what they were offering. Remember what I was saying about crowds, crowds and more crowds. 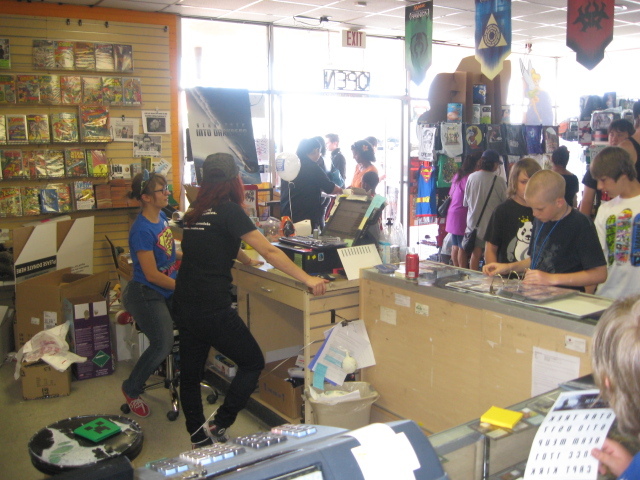 The people inside the Samurai store were so thickly packed that it reminded me of the San Diego ComiCon–a vast sea of people milling about in teeny little shuffle steps, because that’s the only way you can move at all. Phoenix ComiCon may be like that at the end of this month, but it won’t be so bad for me. I’ll hang mostly in the gaming area in a different hotel where it will merely be busy–not sardine-like. The middle of the line waiting to get at the free books. It continues to the left, around the corner, and out the front door. 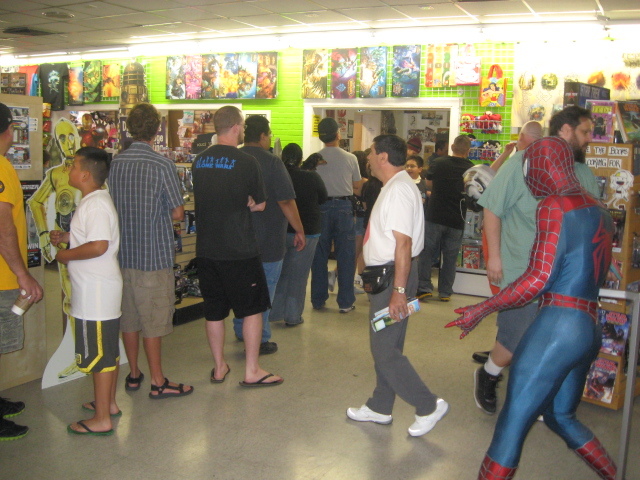 Considering that everybody is likely to buy stuff as well as get a few free comics, this is, I would guess, the biggest sale day of the year for the local comics shops. Spider-Man is just a mannequin. 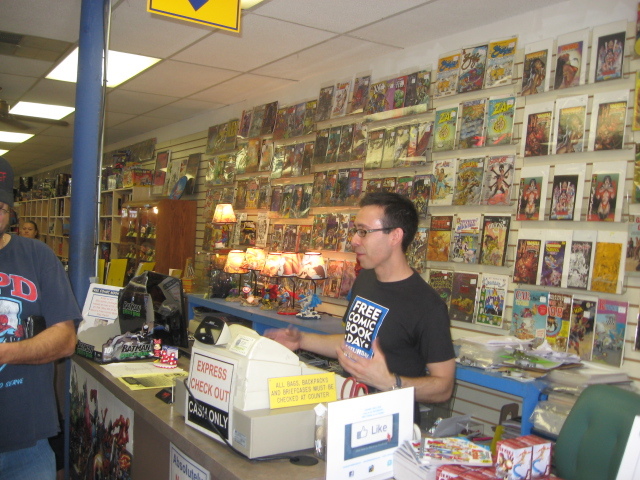 Behind the cash register view of life in a comic book store. They had all the staff there, and some I don’t even know, and I know everybody at this store. The girl in black is Yvette–she’s an artist when she’s not selling comics, and (I wish) she’s my sweetie. I saw Chris and Ray and Shannon and Moriya, and I don’t even know the girl in the super suit. It’s kind of cool that there are kids here, but you see what they’re looking at? Cards, not comics. Heh! Diversify if you want to survive. Goodbye for now, Samurai. I’ll return when I can take two steps without having to beg pardon to get around someone. 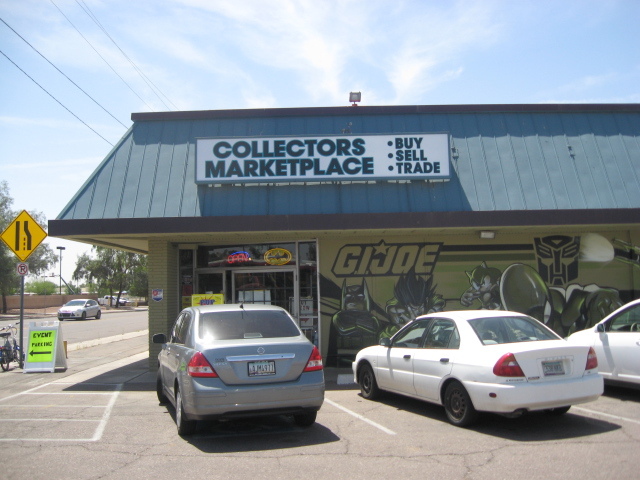 The sign says Collector’s Marketplace, but it’s really a branch office of Pop Culture Classics, whose main store is in Tempe and too far out of my way to visit. Pop Culture Classics is like the Warehouse 13 of KEWL. Comics is only a sideline here, and you have to be willing to pay collector prices to get them, but there sure is a lot of primo collectibles to be had. Still, they were participating in FCBD, and they were in range, so this became my last stop for the day. Great gobs of goodies in all directions. I didn’t know this store was here until today. I must return when I have more time. They buy things. I wonder if I could unload some of the cool stuff I have that I don’t really have room for, or interest in anymore. After all, one man’s trash is another man’s treasure. Problem is, selling your stuff to stores like this, is like giving it away. You never get as much as you paid for it, unless you’re unloading a gift, and then somebody else lost money. Heh! By comparison, PCC didn’t have much to offer in the way of free comics. Judging by the empty places on the table, much of the good stuff was gone before I got there. But, at least, I was finally able to get something here. My choice was the Tick–the quintessential Super Heroes are Dumb, but in a good way funny book. A comic that is actually comical. I spent more time here than in either of my other two favorite places, and that’s because I could walk and breathe at the same time here. I love wall paintings, and there are a lot of them in Phoenix, but most of them are outside the buildings, not inside. I’m impressed that they gave up all this potential display space to show Spidey flashing his buns at us. You can’t see the Spider-Man wildly swinging from one precarious perch to the next without smiling–at least I can’t. And on that note, I swung for home. 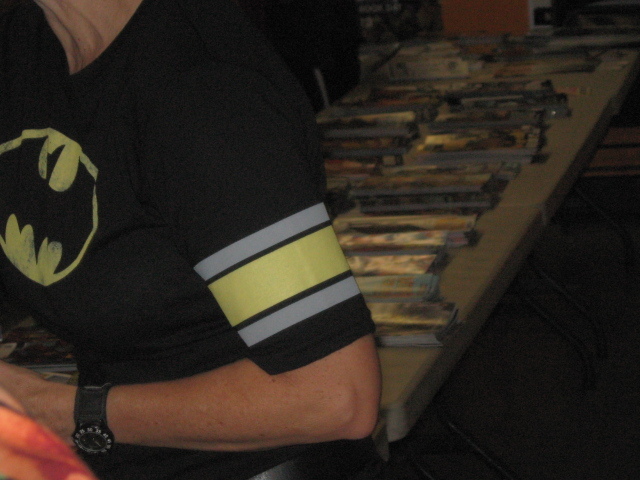 Wasn’t feeling all that good yesterday, but coughing my lungs out wasn’t going to make me miss FCBD. In retrospect, I would say it wasn’t the greatest ever, but it must have been a good day for the shopkeepers, and a fine day for Gerds and Neeks everywhere. Long may FCBD continue. Hey, howza bout a Free Graphic Novels Day? Muwahahahaha! 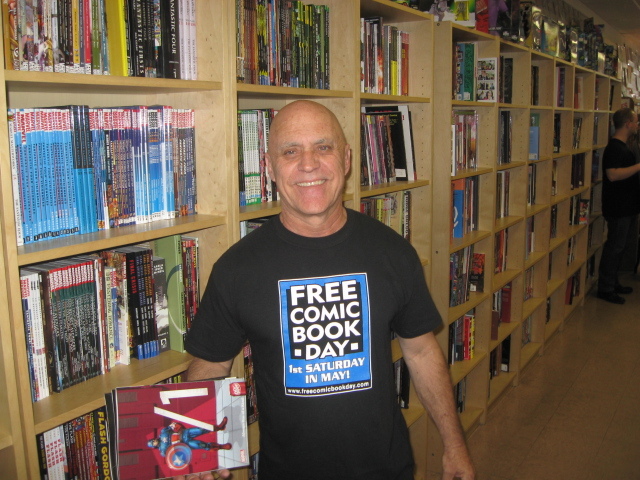 If you got out for Free Comic Books Day and came home with loot, how about leaving a comment? If you missed it, are you gonna try harder to be there for next year’s celebration? 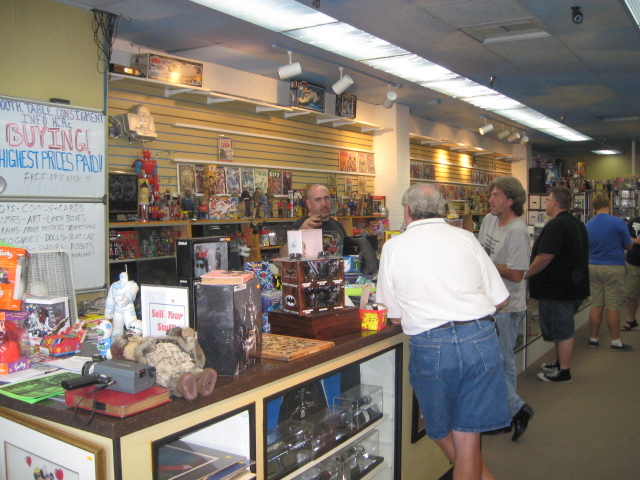 The next big nerd holiday will be Free RPG Day on June 15, 2013. I’ll be more of a participant in that as there will be a great giveaway for Tunnels and Trolls with new material from me inside it. That’s also right in the middle of the Origins National Gaming Convention in Columbus, Ohio. Guess where I’ll be? Grin! If you can make it, come game with me!